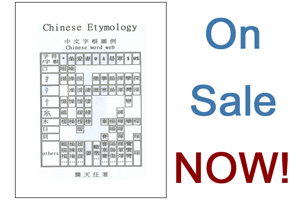 Read through Chinese Word Topology (additional material beyond the textbook). Now that we understand how Chinese words are constructed it is time to start putting our knowledge into practice!Listed under each word root in Lesson One are several higher generation words. For this assignment, we will only be looking at the Generation 1 (G1) words. 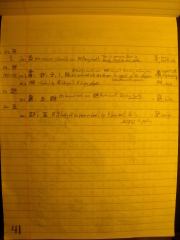 These words are found in the next column of words and are generally listed by numbers (1., 2., 3., etc..). At this time, we will disregard higher generation words (Generation 2 (G2) words, Generation 3 (G3) words, etc..). 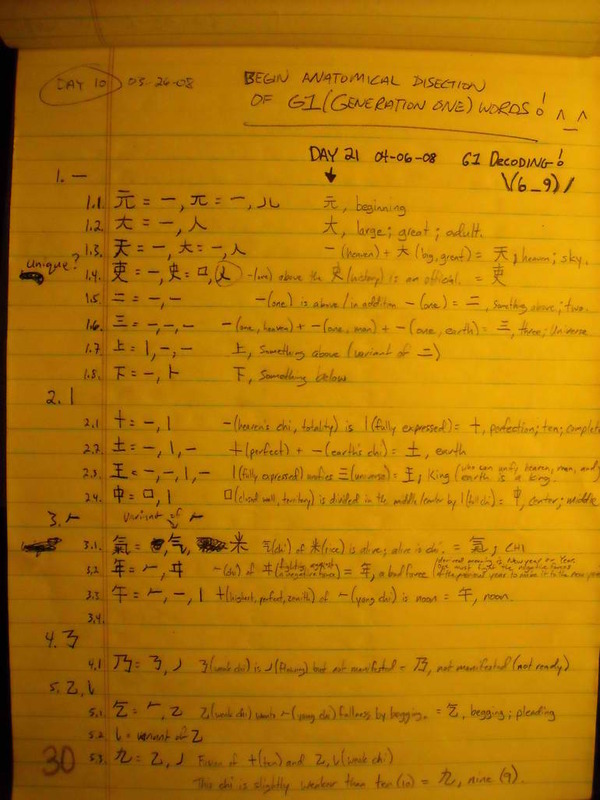 For each G1 word; write it by hand and try to determine its correct pen-stroke sequence, then try to anatomically dissect it to its containing radicals and word roots. First dissect the word to its radicals, then dissect the radicals to their word roots. If a radical is a single word root then it is empirical and this is as far as we need to dissect. There will be a few G1 words that will be difficult to dissect. In fact, at this point there will surely be some that we will be unable to dissect to any degree and there will be some that we will only be able to dissect partially. This normally indicates that the word has some sort of word root fusion, mutation, transformation or form variance; this is further explained in Lesson 2 and Lesson 3. Circle or make note of each G1 word that could not be dissected. Also, leave some space or skip a line for each G1 word, because in Lesson 2, we will return to these dissections to decode their meaning and to correct any dissection mistakes. I began Assignment 4 on March 26, 2008 and completed it in only five days on March 30, 2008. I will go ahead and say that G1 dissection was frustrating for me for two reasons. 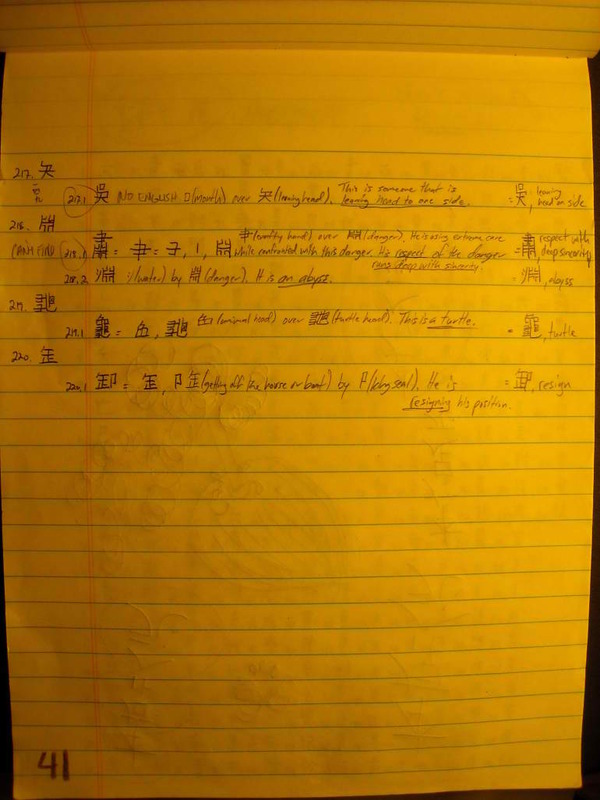 One reason was because I had no knowledge of how Chinese words were constructed topologically. I was, at first, trying to dissect every word empirically down to its containing roots which normally meant nearly taking the word apart stroke by stroke, and this is why, by looking at my homework, one can see that there are hundreds of dissection errors. It was not long before I found out that this was not quite what the assignment really meant for me to do. 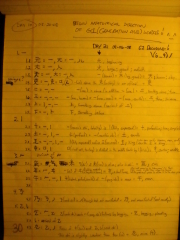 Rather, it meant for me to determine the word’s topology and containing radicals which could be either a single root or more than one root (such as modules) and dissect only to that point. Once I understood this concept it helped a little, but there was still the issue of not knowing whether or not something was being used as a radical! So, in many cases, even if I was able to determine a word’s radicals I would still dissect each radical down to the roots. In retrospect, I think this actually helped my overall writing ability and understanding of radicals simply due to the repetition of writing each part. The second reason for my frustration was that the lesson seemed to be on two extremes. Either I was able glance at the word and immediately be able to dissect it or I would only be able to dissect it partially, or worse, not at all. It just seemed so time consuming and tedious to write out these strokes over and over for the words that seemed so simple and for words that I could not dissect, it seemed almost pointless to me. It was only when I was about three quarters of the way through the entire assignment when it hit me, this lesson is not just teaching me to recognize radicals and introducing mutations, it is training my hand’s muscle memory. It became obvious because after dissecting nearly 750 words I was writing the words correctly without thinking about the strokes and very quickly! All of the sudden my hand hit a breaking point or a critical mass and from that point forward I could write! I quickly finished G1 dissection that night and was anxious to start the next assignment.